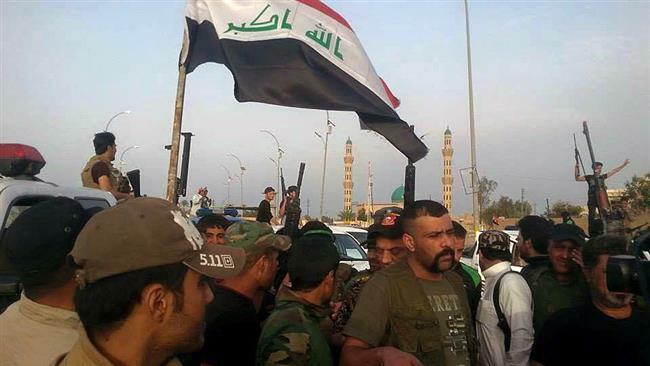 JNN 16 Apr 2015 Baghdad : Iraqi forces have taken full control of the western city of Ramadi from ISIL Takfiri terrorists, in what could be seen as a major blow to Takfiri militants operating in the Arab country. A spokesman for Iraq’s Joint Operation Command on Thursday announced the full liberation of Ramadi, the provincial capital of Anbar province. General Sa’ad Ma’an said the Iraqi forces have driven the ISIL terrorists out of Ramadi and the city is currently under the full control of government forces. However, fierce clashes still continue on the outskirts of the city where ISIL Takfiris seized several villages earlier in the day, including Sofia, Abukhalifa and Sor. Two nearby districts of Bu Mahalat and Bu Sowda have been also captured by the ISIL militants. The Iraqi army has vowed no halt in the operation as it is poised to push ISIL out of the nearby villages in order to secure the army’s positions inside the city. Press TV correspondent Rahshan Saglam said the Iraqi forces also secured the road between Sijariah and Sofia, a strategic connection between the Anbar province and the Jordanian and Syrian borders. The road was used by ISIL militants to get reinforcements from Takfiris inside Syria. Fierce clashes broke out between Iraqi government troops and the ISIL militants holed in the al-Boghanim area. At least six Iraqi security forces and civilians were killed in Thursday’s battles, with dozens of others wounded. The liberation of Ramadi comes against the backdrop of major gains by Iraqi government against ISIL over the past months. The Iraqi forces managed to fully recapture the northern city of Tikrit from the ISIL militants at the end of March. The victory in Tikrit is viewed as a prelude to the Iraqi army’s most-anticipated offensive into the city of Mosul, a major stronghold for the terrorists in north Iraq. ISIL started its campaign of terror in Iraq in early June 2014. The heavily-armed militants took control of the country’s northern city of Mosul before sweeping through parts of the country’s Sunni Arab heartland. Iraqi soldiers, police units, Kurdish forces, Shia volunteers and Sunni tribesmen have succeeded in driving the ISIL terrorists out of some areas in Iraq. This entry was posted in Iraq News, Middle East and tagged Iraq, Iraqi Army, Iraqi Forces, Iraqi government, ISIL, ISIS, Joint Operation Command, Ramadi, Terrorists. Bookmark the permalink.